Hi friends.. 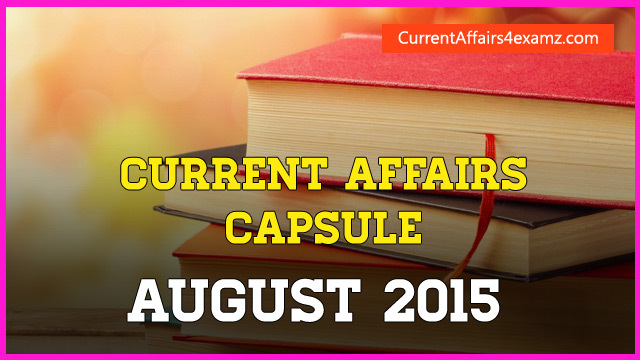 In this post we bring you the Important Current Affairs events for the month of August 2015 in a PDF capsule format. August/September 2015 are filled with many competitive exams being conducted by SSC, UPSC, IBPS and other PSC etc. Our Current Affairs PDF Capsules are always liked by thousands of aspirants. We at Currentaffairs4examz prepare the capsule keeping in mind these exams. You can download the PDF capsule from the below link. You can download the PDF in your Desktop/Laptop/Tab/Mobiles and read wherever you go. If you like the PDF share it with your friends too. Your suggestions are welcome for further improvement. We will be posting Current Affairs Week wise in this post. For the moment we updated First Week PDF. Remaining weeks PDF will be added soon & we are working on it. Also Try our Current Affairs Quiz series to brush up your preparation.